Called the ‘City of Pearls’, Hyderabad is known for its rich history, food and its multi-lingual culture. Home to famous architectural gems like Charminar, Falaknuma Palace, Chowmallah Palace and Makkah Masjid, this place has beauty plastered all over. As the 4th largest city in India, Hyderabad’s skyline boasts the distinctive minarets of mosques, intricate figurines of Hindu temple gods, beautiful Churches and distinctive architecture of Gurudwaras. Besides ancient architecture replete with history, Hyderabad also has some the world's best hotels and hospitality, not to mention the delicious hyderabadi cuisine that's now a specialty at almost all weddings. Goes without saying then that this city is a big hub for shaadis. If you are a local Hyderabadi looking for some insider information on five star wedding venues or are planning a destination wedding in Hyderabadi style, we have tons of dope on some of the best wedding hotels in the city and perhaps the country. Sharing with you our top favourites. These are sure to catch your interest with the stunning banqueting spaces, exceptional facilities and high-class service they have to offer. Take your pick. If you’re looking for a distinctive and sophisticated 5 star wedding hotel in Hyderabad, The Hyderabad Marriott Hotel & Convention Centre offers over 55,000 square feet of beautifully appointed event space for lavish social celebrations. With 2 tastefully designed banquet halls, of which Hall 1 is perfect for big fat Indian wedding celebrations and Hall 2 ideal for medium-sized pre-wedding gatherings. As a full-service wedding hotel, The Hyderabad Marriott Hotel & Convention Centre provides excellent amenities and takes care of all your wedding related requirements, including catering, music & entertainment, as well as liquor arrangements. The venue does not provide in-house décor services; hence let you book your own vendor to deck up the space as per your liking. An esteemed brand hotel of the GreenPark group of hotels, Marigold Hotel is an ideal choice for couples looking to host an extravagant wedding. 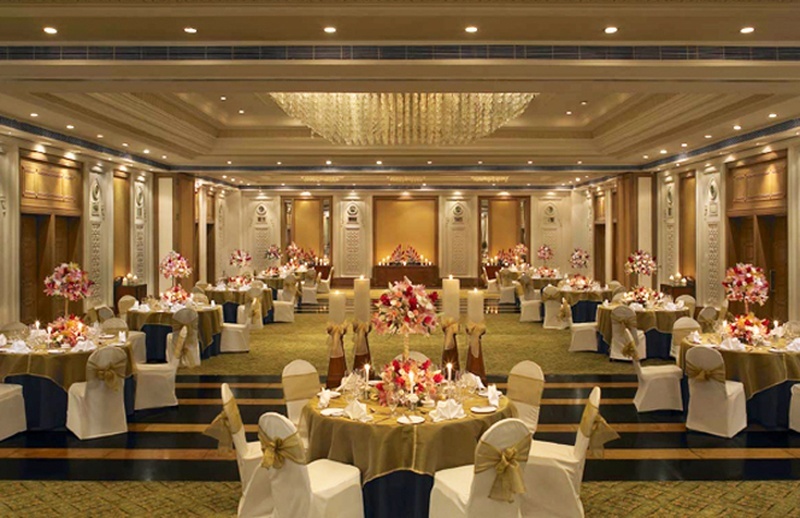 This 5 star wedding hotel in Hyderabad offers 2 medium sized banquet halls each offering sumptuous amenities. The venues expert chefs and bartenders ensure your guests food and drinks are well taken care of. The venue allows you to book your own decorator and DJ to set the perfect ambiance for your event. Popularly known as one of the finest 5 star wedding hotels in Hyderabad, Vivanta by Taj is the chicest and most elegant hotel brand of Taj brands of hotels. Each space whether it is indoor or outdoor is exceptionally designed making it an ideal destination for luxurious wedding, as pre-wedding functions. The venues chefs provide a delectable spread of multi-cuisine meals which can be customized to suit your taste. Liquor arrangements too are done in-house. The venue allows you to book your own DJ and decorator. As one of the top 5 star wedding hotels in Hyderabad, Taj Deccan is another classic venue ideal for hosting elegant pre-wedding and wedding functions. This venue features a medium-sized party hall with excellent facilities. Offering your event complete exclusivity, you can be rest assured your function will get the much deserved attention to detail. Just like Viviana by Taj and Marigold Hotel, Taj Deccan too has expert chefs and bartenders attending to you and your guest’s varied taste palettes. The venue allows outside decorators and DJ with no royalty charges applicable. ITC Kaktiya is one of the most stylish 5 star wedding hotels in Hyderabad known for its finest hospitality services. A brand hotel of the famous ITC Group of hotels at ITC Kaktiya you’re guaranteed high standards of service and style. Equipped with the latest technology and amenities, this wedding hotel is perfect for modern couples looking to host a grand celebration with panache. Their private banqueting space will ensure no disturbance to your functions. This venue too has chefs and bartenders offering a refined spread of food and drinks menu which can be customized to your needs. Outside decorators and DJ are permitted on the premises. One of the most luxurious 5 star wedding hotels in Hyderabad, Hotel Avasa features beautiful interiors, contemporary design combined with traditional Indian patterns and textures. Offering a great mix of both Western and Indian cultures at Hotel Avasa your wedding celebration will not fall short of any facilities. The venue provides its banquet hall and lawn area to celebrate functions, you can choose either or both to have a mix of indoor and outdoor festivity. Their professionally trained culinary team is equipped to prepare a wide variety of delicacies both vegetarian and non-vegetarian. Alcohol is served in-house, but the venue does not restrict you from making outside arrangements. Outside decorator and DJ is also permitted on the premises. Take a look at more such stunning and spectacular 5 star wedding hotels in Hyderabad for all kinds of budget here.